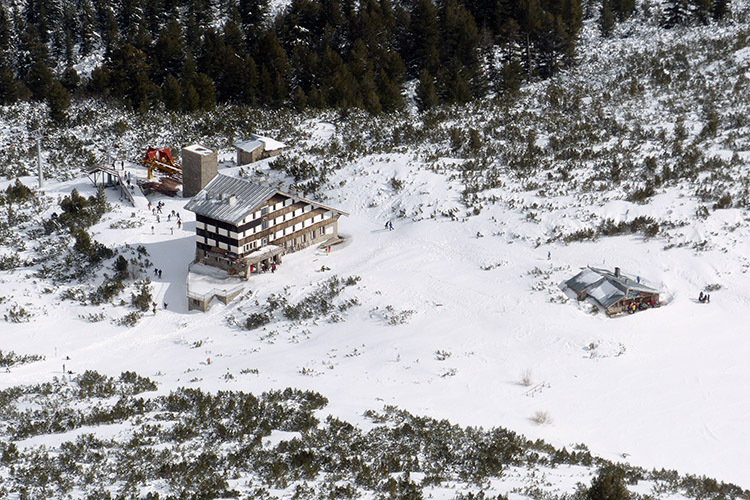 One of the many activities we at Traventuria organize is snowshoeing trips in Bulgaria. 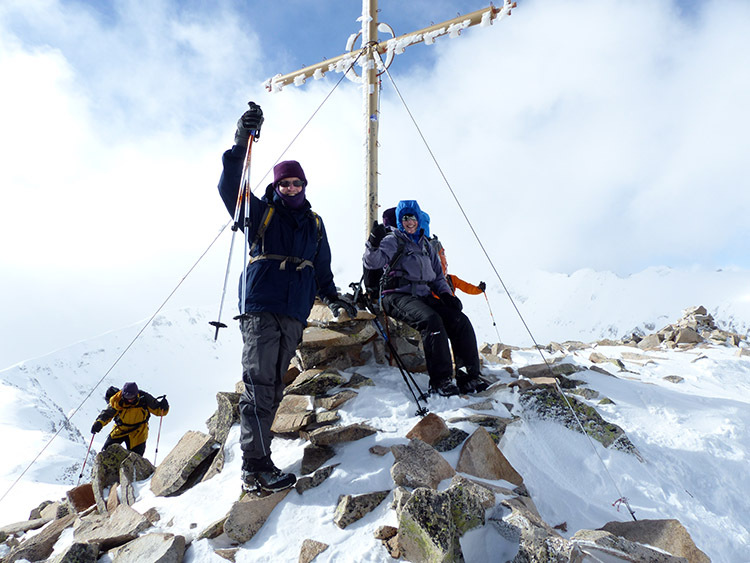 From single day tours to week-long guided and self-guided hiking treks across numerous mountain ranges, you’re bound to find something that suits your desire for adventure. Recently, we had a big group from Ireland who came for our “GREAT WINTER ADVENTURE”. 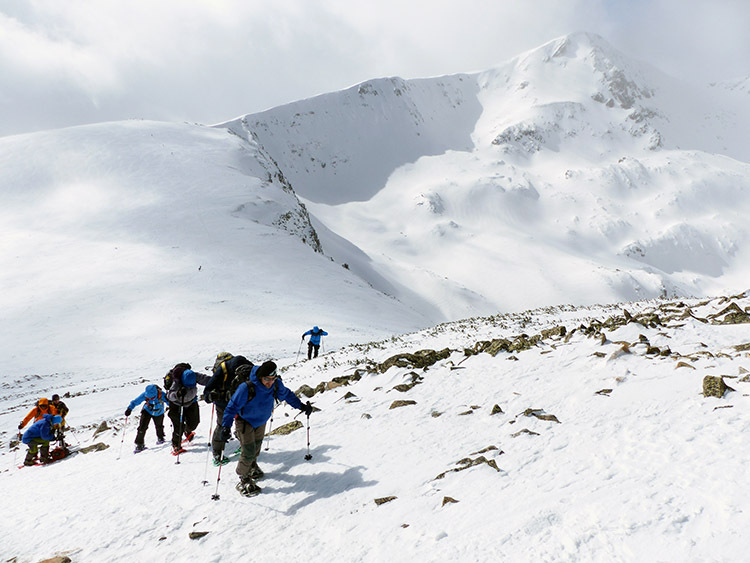 This is an 8-day tour of the Vitosha, Rila and Pirin mountains that finishes off with climbing the Bezbog peak (the name means “without god”). In the post we’re going to show you the last day of the tour, since it can also be booked separately as a single-day tour from our rental shop in Bansko. 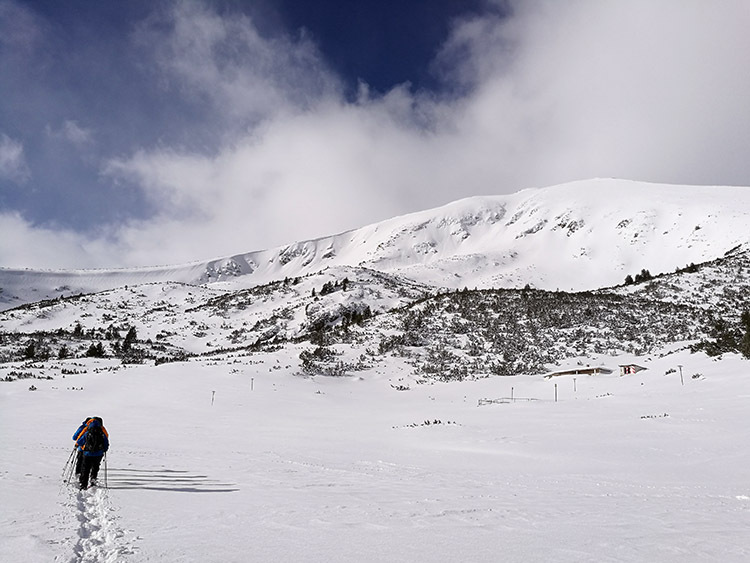 See our snowshoeing day tour from Bansko to Damianica hut. We start off by crossing the frozen Bezbog lake. Our goal, the peak to the right. Our day started at 8:30 AM in Bansko when we boarded the Traventuria bus and were off to Dobrinishte, a neighboring town. The drive from Bansko to the chairlift above the town is around 30 minutes and it takes another 30 minutes to get to the top station if there is no queue. The chairlift takes us to the Bezbog hut (2236m.asl. ), which was the starting point for our journey. Once our gear was in order and we had our snowshoes on, it was time to start our walk. We took a small detour towards the Polezhan peak. The journey starts out by crossing the frozen Bezbog lake, which has a sufficient snow cover this time of year. Once we’ve passed the lake, we start our ascent towards the peak. Our guide for the trip, Mitko, decided to take us first in the direction of the neighboring Polezhan peak (2850m.asl. ), as we would see some amazing views from the ridge between the two peaks. We head up towards mt. Bezbog with mt. Plezhan behind us. 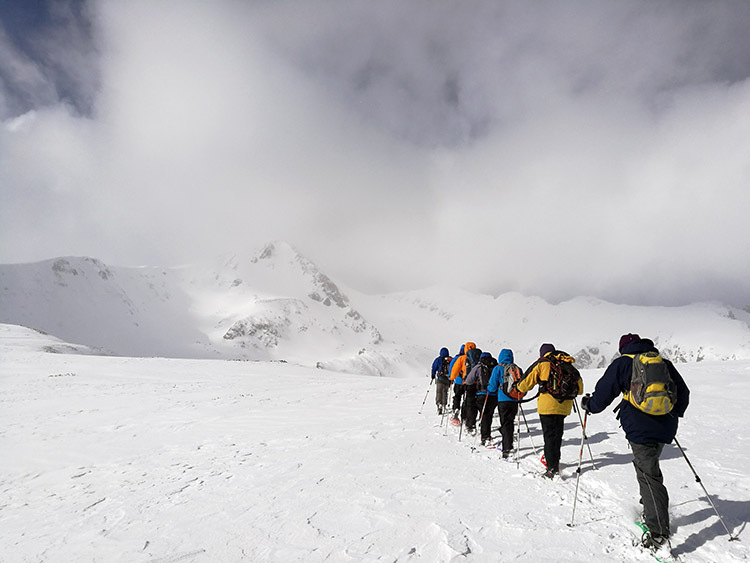 After a short break near the Polezhan peak, it was time walk back a few hundred meters and start our climb towards the Bezbog peak (2645m.asl.). By now we had already passed the half-way mark in terms of altitude. We climb the peak from the south side, which has many rocks just under the peak. The last 50m of our ascent was done on foot, as our snowshoes would only be a hindrance on the rocks. The Bezbog peak is 2645m.asl. Once at the peak it was time for a short rest. It was too windy up top to sit for a longer break and after we were done taking photos it was time to go back down. We did our descent down the north side of the mountain, taking a different route than our ascent. Due to the winds, much of the snow was blown onto the north ridge where we were descending. This meant that the snow was much deeper than on our ascent, however, this made little difference since we had our snowshoes on. At the end of our walk, we had to push through a small section of mountain pine trees, before reaching the Bezbog Hut. The total walking distance was around 6-7km. Our start and finish, the Bezbog Hut. Once at the hut it was time for a well-deserved warm meal in its restaurant. A quick 30-minute break and we headed towards the lift to get back down to the village. The whole journey took us roughly 6 hours, this includes the drive, chairlift and so on. By 2:30 PM we were back at the hotel, ready for a final day in Bansko. See our 8-day snowshoeing itineraries. 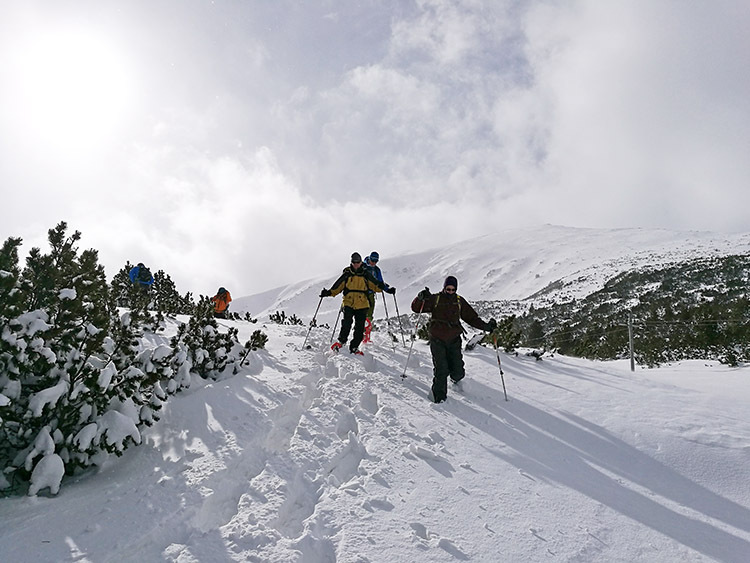 See our single day snowshoe tours from Bansko.